As the final heavy cruiser of Scotia IV’s skeleton defense fleet burned in the upper atmosphere of the now encircled planet, Perturabo’s iron sons prepared for grueling siege to come. 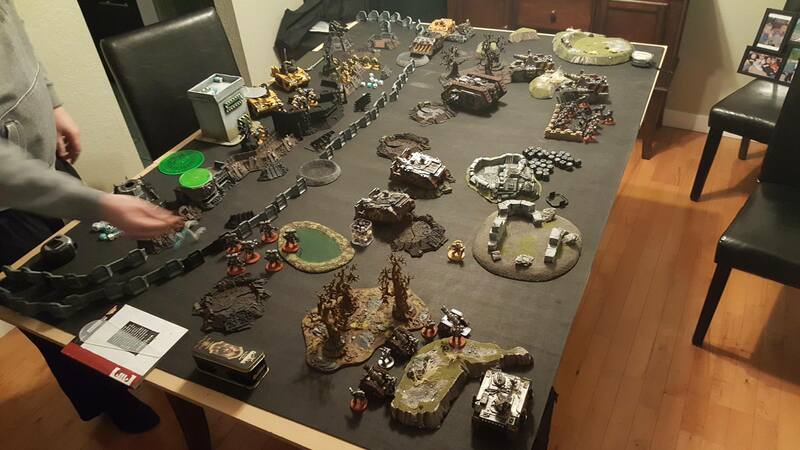 This is the battle report from the first game of a mini campaign that myself (controlling the mighty Iron Warriors) and Jeremy (controlling the stalwart Imperial Fists) are doing. The details on how the campaign is working can be found HERE. Mission 1 – Bunker Assault. Victory Points to determine the winner. 12 inch deployment from the table edge for both players. Attackers: 1 VP for each fortification destroyed. 3 VP for destroying or capturing the targeting relay (located inside a fortification). Both Players: 1 VP for each unit destroyed or falling back at the end of the game. First Blood, Line Breaker, Slay the Warlord. 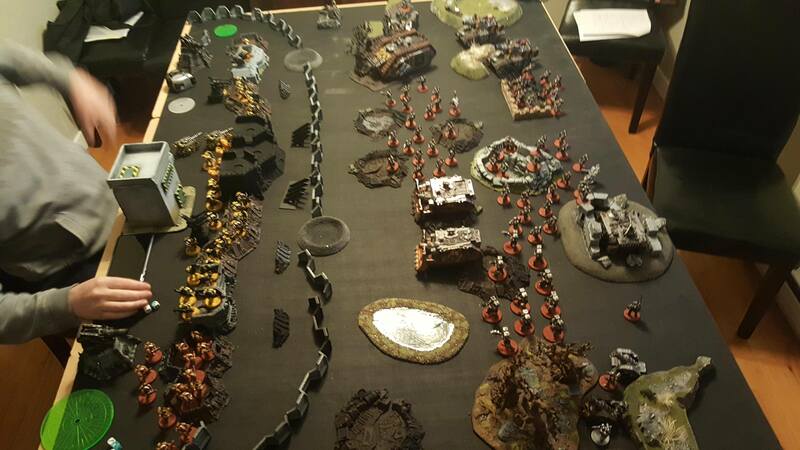 Turn 1 saw an impressive level of destruction rain down from the Iron Warrior positions. The infantry, spartan, and medusa all advanced straight forward towards the enemy lines. Then began the shooting. Everything in the army opened fire except the tacticals who ran forward to cover as much ground as possible. 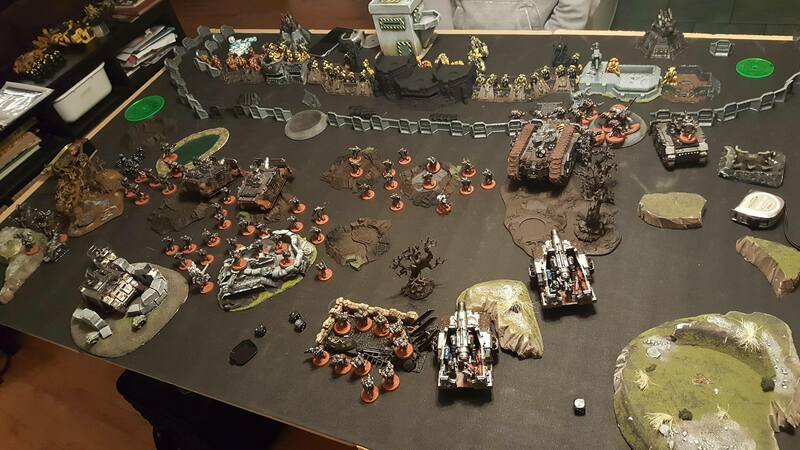 The Tyrant Terminators, in a massive volley of fire with the wrecker rule managed to destroy the primary objective in a single volley. The collapsing building killed 3 terminators that were inside with Captain Pollux. Further shooting and shelling destroyed the left most bunker and the center bunker. 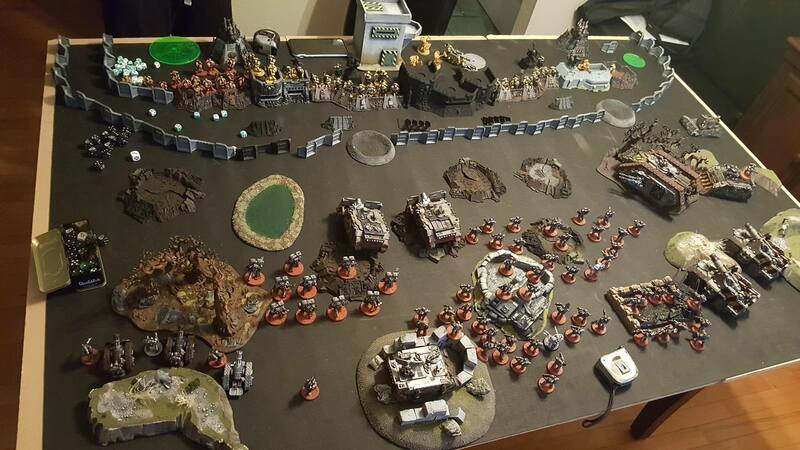 The only one left standing was the right flank where the spartan full of terminators and Captain Golg were heading towards. The Imperial fists, shaken by the opening volleys, returned fire with righteous fury. Both vindicators were turned into slag heaps from massive heavy volkite fire. Pollux and his terminators rallied and began heading to the right flank, ready for the advancing spartan. 1 of the medusa’s was knocked out and the spartan took some damage from grav fire as well. 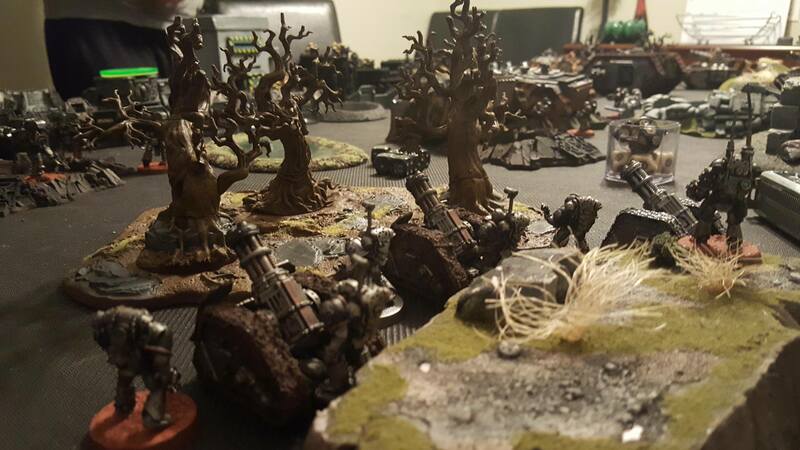 Undeterred by their casualties, the Iron Warriors pushed on. 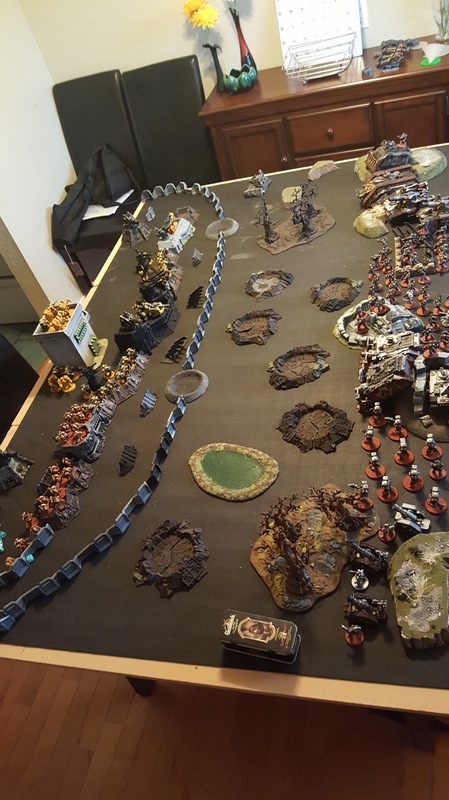 The Iron Warriors continued pushing straight into the enemy lines. 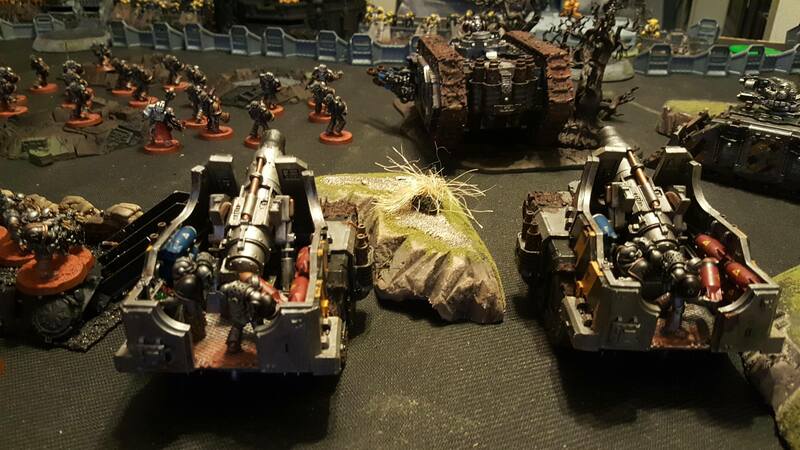 The spartan tank drove right into the enemy walls and unleashed its payload of Golg and his terminators. The quad mortars pummeled the enemy infantry holding the right flank reducing most of their numbers. The surviving medusa fired into the enemy ranks but was not able to inflict much damage. Golg in his terminators charged into the final bunker, after all weapons fired at it fired to bring it down first, quickly wrecking the structure. Some infantry inside perished but the majority of the volkite squad survived to fire back. The Imperial Fists saw their first reserves come in from their lines in the form of veteran infantry with heavy bolters and combi weapons. 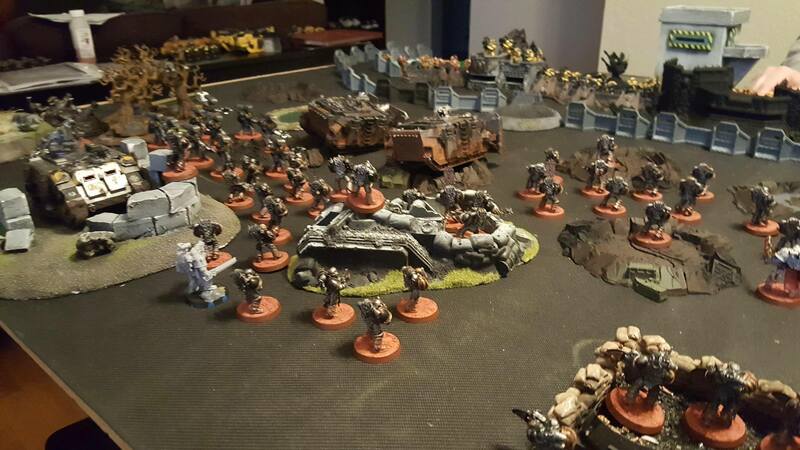 They, together with the volkite troops and some breachers unleashed a mighty volley into the terminators but could not bring them all down. Across the rest of the board the tacticals were taking fire from the front lines but were able to keep up their advance. With all the main objectives now destroyed there were still two enemy automated battlecannons firing from the back lines to try and take out. Every unit destroyed now would also count. The quad guns finished off the rest of the infantry on the left flank leaving the Tyrant terminators to advance with little opposition. The infantry advanced to just within striking distance and unleashed their fire into the enemy manning the trenches. The combat support squad bailed from their rhino to unload a torrent of plasma shots into the vulkite squad and finished them off, leaving the terminators free to charge into the veterans. In a bellowing roar Golg challenged the enemy sgt to a duel….and was brutally smashed down in the process, gravely wounded. The enemy sgt did not survive to enjoy his victory. By the end a couple terminators still stood locked in combat with the veterans, who would not flee. 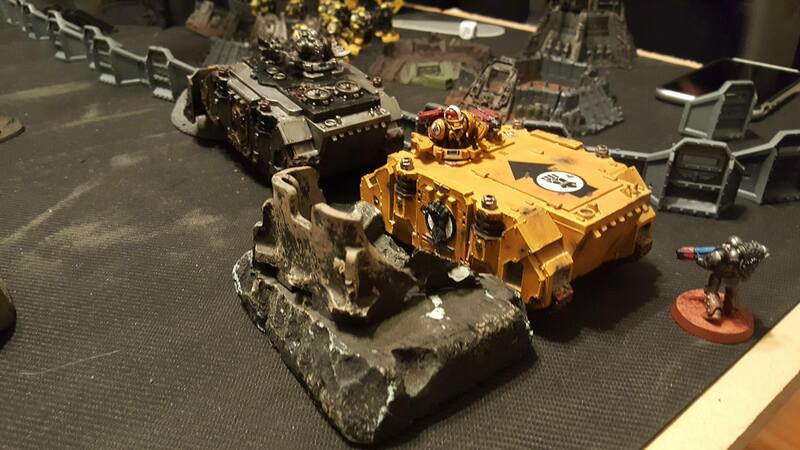 The Imperial fists had more reserves show up to bolster their lines, 2 medusa siege tanks. They took aim at the tyrant terminators, hoping to eliminate their unit, but only inflicting a couple of casualties. Pollux and his terminators sallied forth to strike into first tactical squad about to breach the lines and wiped them out to a man. 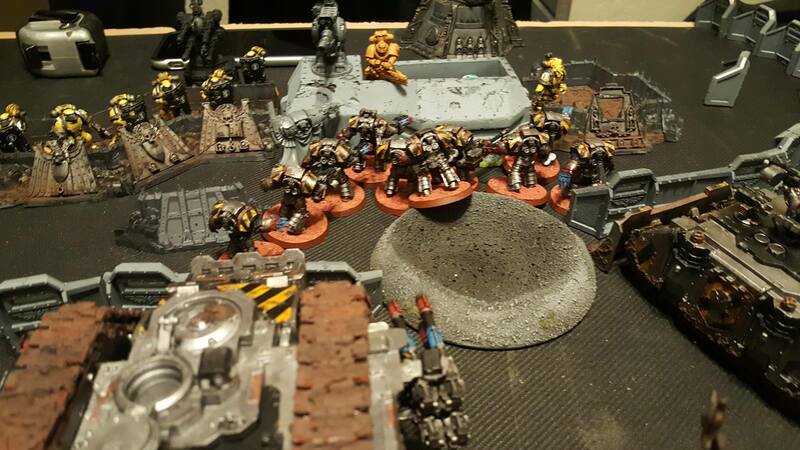 The close combat between terminators and veterans continued, with all but 1 terminator wiped out and 2 veteran marines still trying to bring him down. The plasma support squad came under sustained fire and lost many of their number. The final turns became a grind for victory points, trying to wipe each other out to take the lead. 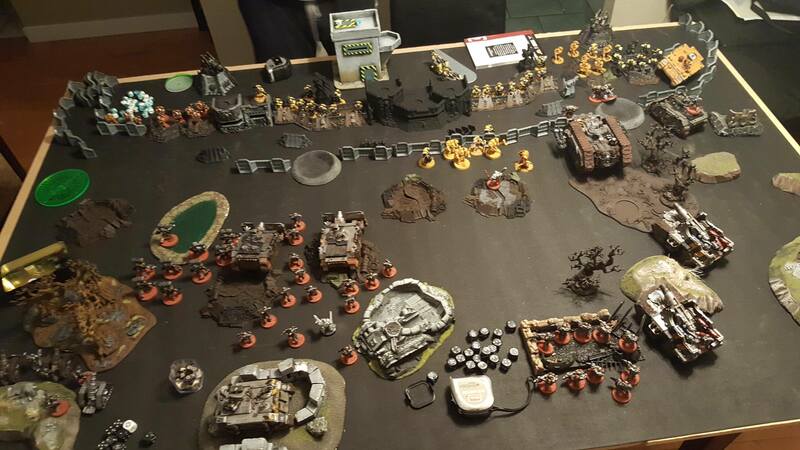 On the right flank, the terminators, veterans, rhinos, medusa, and spartan were all killed off. The only thing standing was the full Iron Havoc squad dug in with few targets left, and a squad of breachers on the opposite end holding their shattered walls. Captain Pollux and his terminators smashed into the second tactical squad, grinding them down and continuing to push into the Iron Warrior deployment zone, attempting to score line breaker. 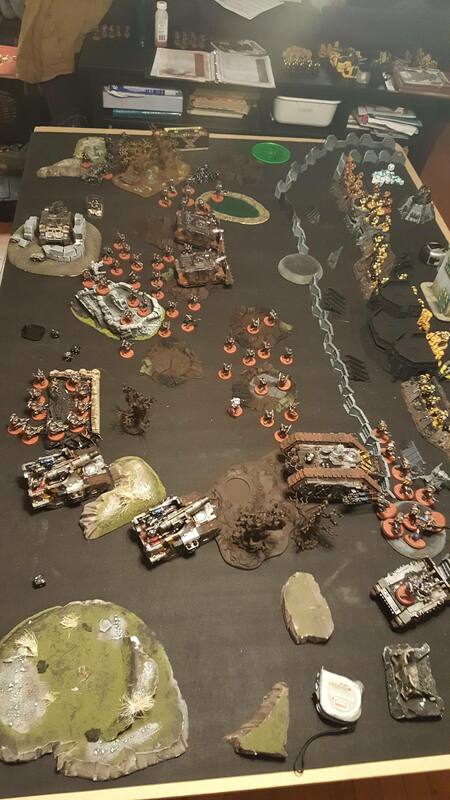 The tyrant terminators finished off the automated turret and another squad to score more points bringing the game to a dead tie on turn 5. 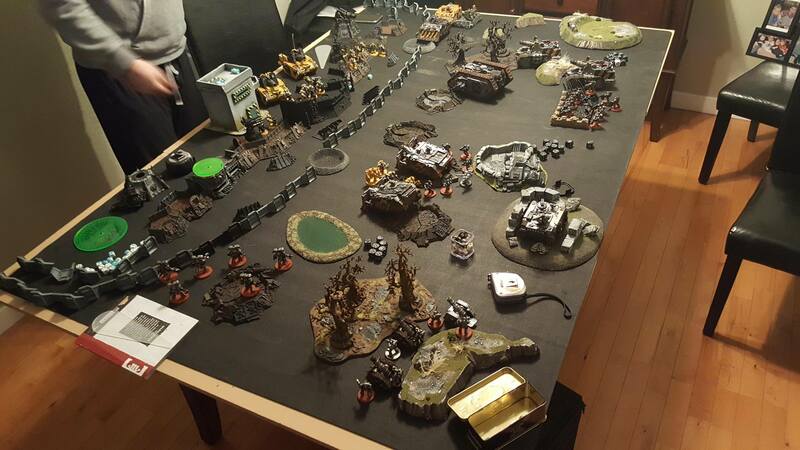 Both the Imperial Fists and Iron Warriors can choose to force a turn 6 due to their RoW. Hoping for a lucky tie break, I chose for a final round. The command rhino backed up at flank speed to evade the incoming terminators and that left the quad mortars to unleash a full round of heavy shatter shells right into them. In a stroke of luck, they all died, leaving Pollux by himself and with no unit to still score line breaker. 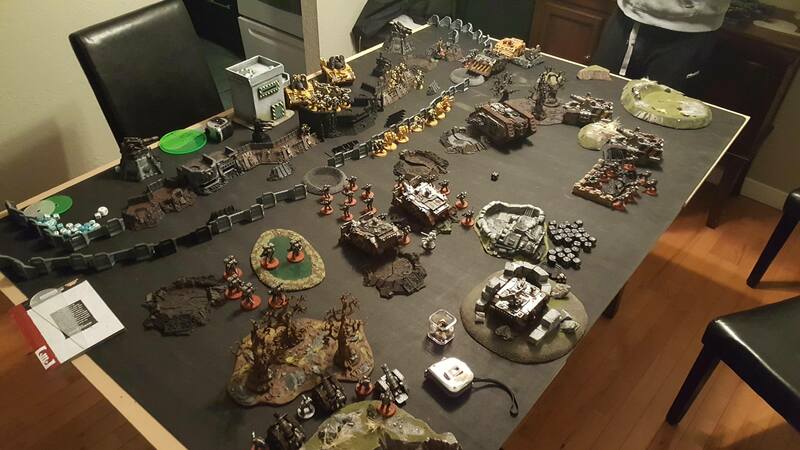 The game ended with the Iron Warriors taking a 2 point lead, both sides massively damaged. The only characters left standing at the end for the Iron Warriors were the Master of Signals (Arastos), the Iron Havoc sgt (Argos) and the Siege Tyrant sgt (Aristodemos). The rest had to roll on the injury chart but luckily lost nobody to permanent death. Golg’s run in with the pesky veteran sgt left suffering permanent damage to his reflexes, dropping both his WS and BS by a point. My plasma support squad sgt, taking a nasty blow to his head and being knocked out, found his personality a bit..altered. Instead of being cold and tactical he was filled with a rage and constant desire to dive headlong into close combat…he must now always attempt to move closer and assault his enemy if possible. Both of my apothecaries have been too badly wounded to fight in the next battle and will miss it, as will a couple others. I’m not exactly sure on all the Imperial Fist results other than Pollux gaining +1 Toughness!! That’s all! Tune in next time for game 2 coming sometime in the next couple of weeks! Sounds like an epic game, mate – and good to see you teach those yellow bastards a thing or two! Well, two points at least!